How To Eat Healthy In Restaurants | Gina Miller's Blog - A working mom's blog about fitness, travel, handbags & beauty. Order two appetizers as a meal. Appetizers are usually more interesting than the entrees. The portions are also large, making them substantial enough to satisfy you. Order plain balsamic vinegar on your salad dressing. Salad dressings, especially creamy ones are a diet disaster. Most restaurants have plain balsamic vinegar. The vinegar provides minimal calories and delivers an interesting flavor. No vinegar? Ask for lemon and a bit of olive oil. Leave a few bites on your plate. Restaurant portions are too big. Most human beings don't need all that food. If leaving a few bites makes you feel guilty, get a doggy bag. Put your fork down between bites. It forces you to eat more slowly which, in turn, helps you consume fewer calories. Learn more about this trick here. If the bread is boring, don't eat it. Unless you're at Poîlane or Les Pain et des Idées in Paris, there will always be better bread. 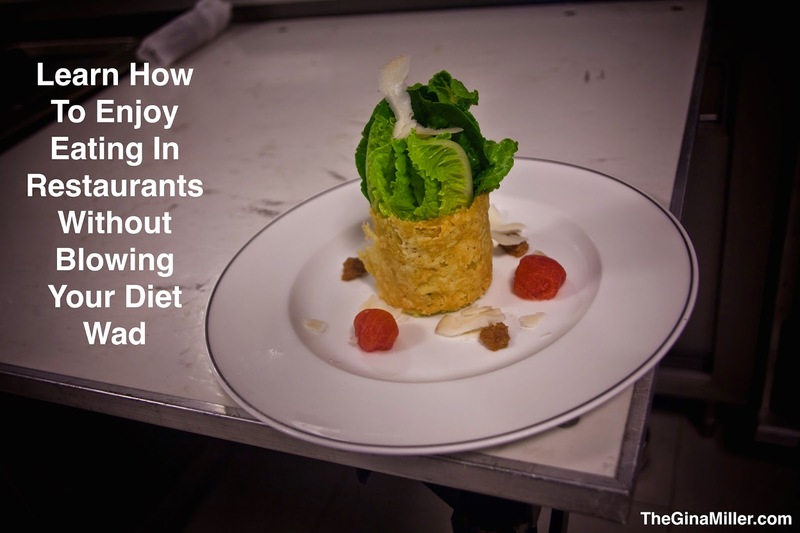 The New York Times takes it one step further with an outstanding feature teaching you How To Eat Healthy In Restaurants. It has advice for navigating restaurants like Subway, Chipotle, Cheesecake Factory, Capital Grille and more. Bonus Tip: many chain restaurants post their nutrition menus online. If there is a place you frequent, take a moment to look at the nutrition totals for some of your favorite menu items. I did that...and stopped eating Corner Bakery's Chicken Salad sandwich forever.